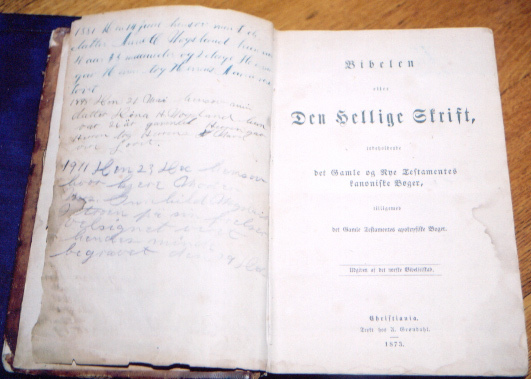 The Bible (Bibelen) was printed in 1873 in Christiania, which is what Oslo was called until 1925. 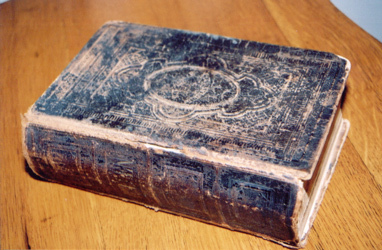 Thereafter it was shipped to America and became the property of Ole Wogsland. The entries dated 1876 and 1877 were most likely written by Ole himself. 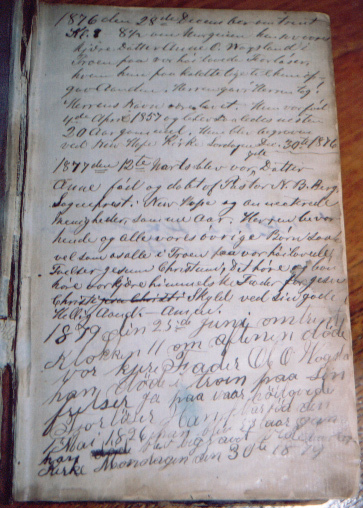 The 1879 entry chronicles Ole's death and refers to him as "Fader", meaning it was probably written by one of his offspring. It may have been his wife Gunhild however. Either way it is clearly in a different hand (compare "H" for example). 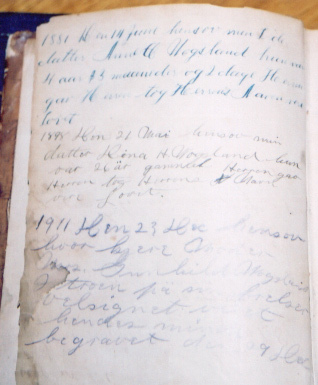 The 1881 entry mentions "datter" Anne O. Wogsland, thus was most likely written by Gunhild. The hand which wrote this is also clearly different from the earlier two (again look at "H") The authorship of the 1898 and 1911 entries is less clear as of yet, although they appear to be in the same hand as the 1879 entry. The latter of those refers to Gunhild's death. 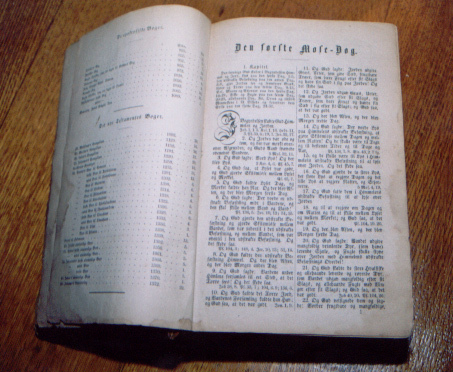 Thereafter the history of the Bibelen is not known until it fell into the hands of Sylvia Wogsland, who gave it to her brother Lyle Wogsland. Lyle died in 2004 and the Ole Wogsland Bibelen currently resides in the collection of his wife Barb Wogsland. hve? hun paa kaldte lige til hun??? gav Aanden. Herren gav, Herren tog! Frelser Jesuus Christuus, Det h�re og ?o?? half past 8 O'clock ????? gave the Spirit. The Lord giveth and the Lord taketh away! The Lords Name ? the law. She ???? April 4th, 1857 and ? ? ? ? ? New Hope and ?
? (honor?), ? year(s). The Lord before? good? sheep, in the Faith of ? Redeemer Jesus Christ. Those that hear and ? Christ guilt with his ? Father Ole O Wogsland died (with a priest?). 1st of May 1826. He (was?) 58 years old. Church Monday the 30th 1879. 1. Pictures taken by Nancy Wogsland in the Fall of 2004. This page last changed 12 December 2004 by Bradley J. Wogsland .